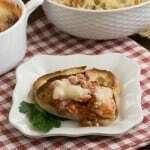 An appetizer inspired by the classic lasagna recipe!! Saute onion in olive oil till softened. Add garlic and cook for just a minute or two. Add the salt, pepper, tomatoes, bay leaf and oregano. Bring to a simmer and add red wine. Cook for about 30 minutes, taste and add more seasoning as needed. Remove bay leaf before using. Preheat oven to 350º. Spread cream cheese in the bottom of a pie plate or small casserole dish. Mix sausage and marinara sauce and layer over cream cheese. Top with mozzarella. Bake or 15 minutes or till cheese is melted, starting to bubble and lightly browned. Serve warm with baguette toasts.